At Doorstep Details, we do our best to improve the lives of residents and maintain cost-effectiveness for developers and property managers. We are national leaders in providing affordable apartment and condo doorstep trash pickup, offering services five days a week. Our highly trained, insured, and licensed valet trash porters have provided services for thousands of residents throughout the United States on a nightly basis. If you want efficient and reliable trash retrieval services, you can request a free quote from us at any time and we’ll develop a plan that works best for you, based on the details of your community. Whether you want valet trash pickup only, valet trash and doorstep recycling, services for a new construction community, or a bid for multiple communities, we’re here to help you get what you need. Contact us for FREE Valet Trash Quote Today, CALL 866.698.2874 or Please Fill Out the Valet Trash Quote Form. The way we work is simple, delivering a new 13-gallon container to every unit in the community, which residents can then use to store bagged trash and place outside of their doorsteps for trash retrieval. We will pick up trash according to the industry-standard schedule, arriving Sunday through Thursday from 6 p.m. to 8 p.m. Our Doorstep Details-Valet Trash Porters remove the bagged trash from each container using our leak-proof satchels, with pickup starting at 8 p.m. Our porters then dispose of the trash in the community’s nearby compactors or dumpsters. We also clean the area surrounding the compactors and dumpsters. Once we have completed pickup, we will conclude our services by sending a “Doorstep Details Report” to property managers. DD Reports are always made easy for our customers to understand, with .pdf documents that report all arrival and departure times with GPS dates and time stamps, along with building pickup confirmation and after-service photos of all units serviced. Using the Doorstep Details app on enabled smartphones, our porters can quickly send detailed pickup information and photos for every report. Valet Trash Tampa places an emphasis on the resident experience with every service. Residents will benefit from the convenience of regular trash pickup, without any of the safety risks that can come from nightly trips to the compactor or dumpster. To help introduce residents to our services, we provide a free resident appreciation day for each newly contracted community, which features free food and drinks, giveaways, and additional information about our services. With the help of our affordable phase-in rates and a price-match guarantee, the property management groups we work with will be able to benefit from a significant increase in new operating income per unit. AWS has also been “A-Rated” by the Better Business Bureau as a Compliance Depot Certified vendor. 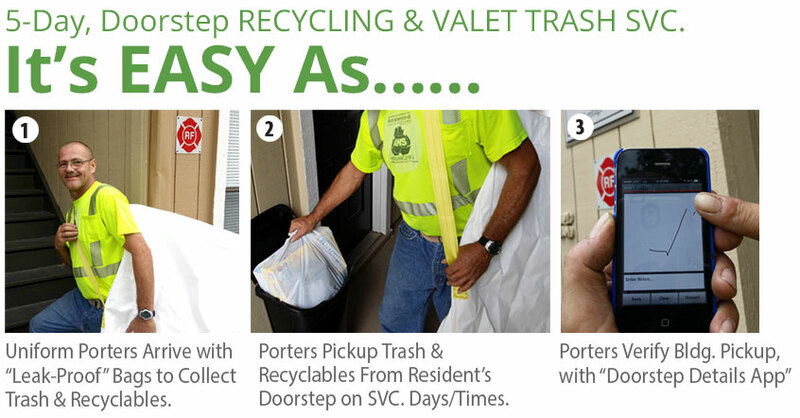 If you would like to work with Doorstep Details, simply fill out our Valet Trash quote form for a free bid today!